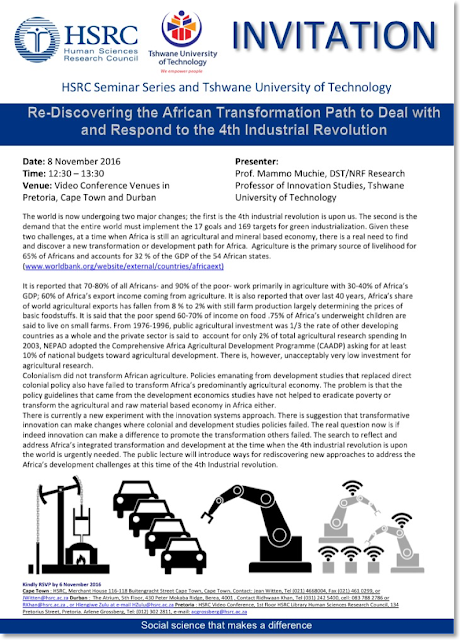 This seminar may be attended via video conference in Pretoria, Cape Town and KwaZulu-Natal. Details are indicated below. The world is now undergoing two major changes; the first is the 4th industrial revolution is upon us. The second is the demand that the entire world must implement the 17 goals and 169 targets for green industrialization. Given these two challenges, at a time when Africa is still an agricultural and mineral based economy, there is a real need to find and discover a new transformation or development path for Africa. Agriculture is the primary source of livelihood for 65% of Africans and accounts for 32 % of the GDP of the 54 African states. (www.worldbank.org/website/external/countries/africaext) It is reported that 70-80% of all Africans- and 90% of the poor- work primarily in agriculture with 30-40% of Africa’s GDP; 60% of Africa’s export income coming from agriculture. It is also reported that over last 40 years, Africa’s share of world agricultural exports has fallen from 8 % to 2% with still farm production largely determining the prices of basic foodstuffs. It is said that the poor spend 60-70% of income on food .75% of Africa’s underweight children are said to live on small farms. From 1976-1996, public agricultural investment was 1/3 the rate of other developing countries as a whole and the private sector is said to account for only 2% of total agricultural research spending In 2003, NEPAD adopted the Comprehensive Africa Agricultural Development Programme (CAADP) asking for at least 10% of national budgets toward agricultural development. There is, however, unacceptably very low investment for agricultural research. Colonialism did not transform African agriculture. Policies emanating from development studies that replaced direct colonial policy also have failed to transform Africa’s predominantly agricultural economy. The problem is that the policy guidelines that came from the development economics studies have not helped to eradicate poverty or transform the agricultural and raw material based economy in Africa either.